With tiny bits if info scattered and rare, I thought it would be cool to have one thread to mention/display/share/request info all all things relating to hacking or modding plug 'n' play TV games. Post up, y'all!! To start, I thought I'd put up one of the neatest things I've seen RE: hack/mod TV game. I'm planning on doing something similar, although smaller with just a 12" TV or maybe even just a PSOne screen. I just have a small apartment, so size is definitely an issue. 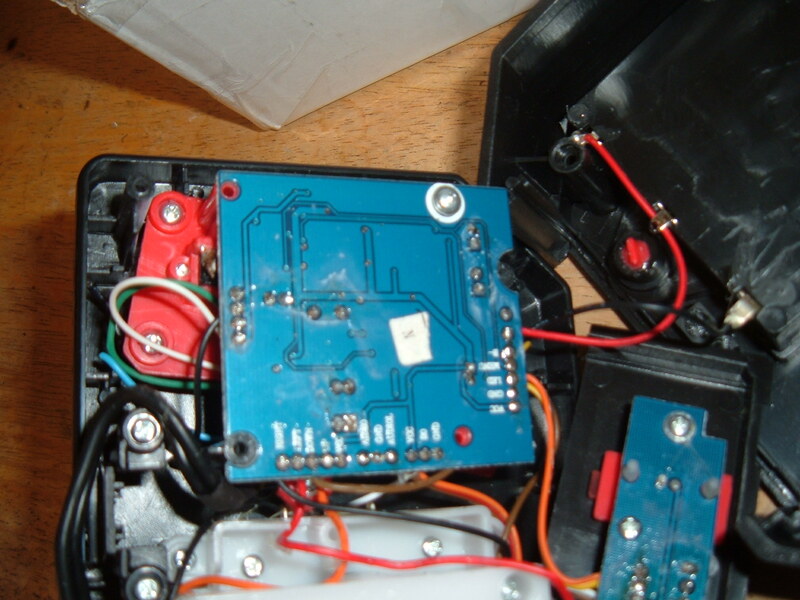 For the most part, hacking apart a TV game to use in this way is easy--most of the stuff inside is just switches that you can easily solder to and replace with whatever kind of buttons and sticks you like. However, the Jaxx TV games with the "twist" joystick for Pole Position leave my limited electronics knowledge stumped. 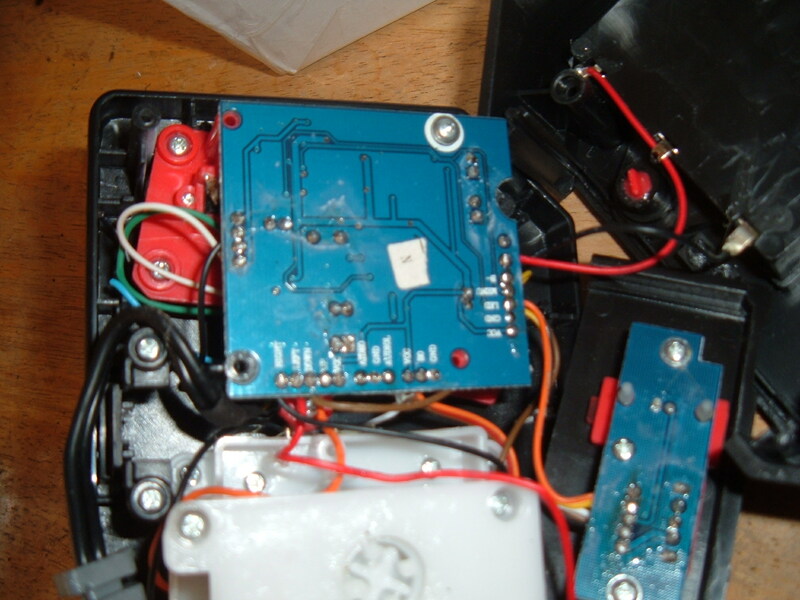 Anyone got an idea how I could use its guts in a lil' arcade machine using an arcade joystick and maybe a spinner or a hacked Atari paddle/or off-the-shelf pot or something? If I could figure it out, I could build a groovy little steering wheel or maybe dismantle an old PC or Playstation steering wheel--maybe that's the replacement part option. I see them turn up fer cheep in thrifts/flea markets here and there, but it's the way the wiring will work that I don't get. Is the twist stick an encoder? I dunno--what would it look like if it was? I can get a pic going here later, but so far all I know is it's a bit of a mystery. He made some other cool stuff. Very cool! I hadn't seen those, thanks for adding them! 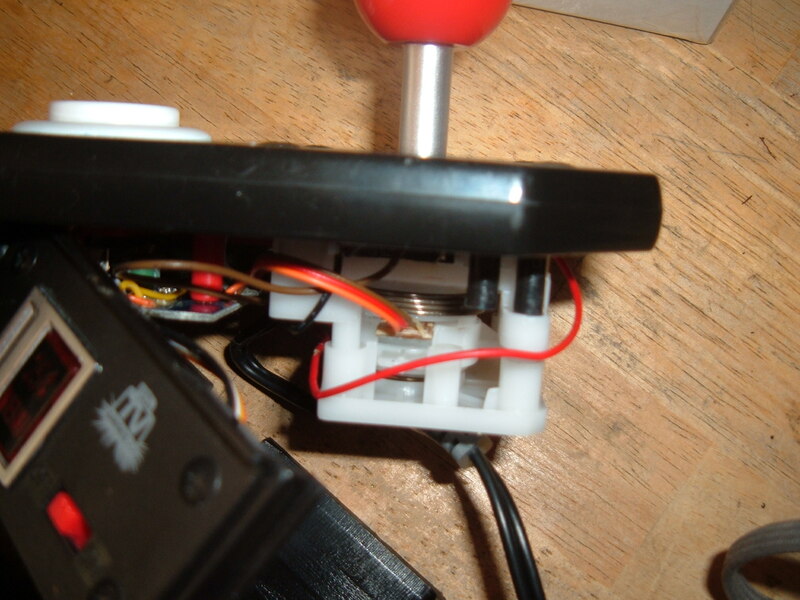 The two pix of the joystick itself show a tiny little greenboard connector with three wires coming off the spring-loaded "twist" portion of the joystick; the normal joystick left/right/up/down portions each have their own individual submicro switch, pretty standard and easy to work with there. Sooo, got any clues as to what/how/when/where I could tap into that stuff for putting this into my own little arcade machine? Thank you Gorf and anyone else who might respond! ... 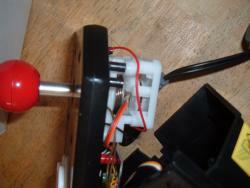 I'm in the middle of doing my conversion of that to a 7800 joystick/paddle adapter. I'll post pics when I get a little farther. BTW, to do this you need a DTDP switch because we have to change two wires (the 7800 uses the paddle lines for the two fire buttons). I'm just hoping the resistance in the pot in this thing is comparable to the one in the 2600 paddles. If not, I have to see if I can 'convert' it. Has anybody ever managed to pull the games off any of these plug-n-plays? It would be curious and amusing to see the NoaC-based games played on a real NES. Wish he'd post pics of the guts, even if it is rough work, as it inspired me to hack one of mine in a similar way. Don't ask how I ended up with two of these generally crappy Atari joystick plug-n-play TV games. Edited by brojamfootball, Thu Feb 26, 2009 5:02 PM. Generally, the chips in the p-n-p TV games are covered with the legendary "giant glop of rock hard goo smothering the whole thing" that makes it next to impossible. I wish they wouldn't do that in lame efforts to protect what is already everywhere all over the net. It would make it way easier to combine a bunch of tv games with one set of controls. I've been trying to brainstorm doing that with a buttload of switches or something to use in my mini arcade project mentioned a couple places in this thread already. I know, I know, why not use MAME? Cause I don't wanna buy another computer($$$$), risk crashes, etc. I like the hardwired stuff that just works and works and works, plus I have an ever-growing collection of TV games acquired for cheap/free from flea markets, Craig's List and thrift stores. B) Stuff they've stolen in the first place. Edited by brojamfootball, Thu Feb 26, 2009 5:05 PM. Actually most of the plug-in-plays are also NoaC based, including pretty much all the Jakks sticks and the original Flashback. That's why I was curious if anybody had managed to extract them. I know those glops make direct chip rips pretty much impossible, but people have found ways around that before. The Flashback 2 had its games ripped out in fairly short order, though to be fair the FB2 is by design more hackable than most plug-in-plays. Edited by skunkworx, Thu Feb 26, 2009 5:06 PM. It is possible by tracing the pcb, and with some pretty intense programming and electronics knowledge(programming that almost has to be insider knowledge in some cases and electronics stuff that's way out of my league anyway), just not probable and nearly never done. I know that at least a good chunk of the Flashback 2 stuff was already on the web prior to its release as well(i.e. Save Mary was a prototype I'd seen before), but you're right: it was done, and also right that that's one hack-friendly unit! As far as I know, it's only what I'll refer to as the "crappy" plug and plays that are Nintendo on a chip(Super Joy Pad, Atari Joystick--Flashback 1 as well?, the mini Atari Keychains, XXXXCast, XXXXstation, anything that lists 50+ games built in--pretty much everything imported from Japan or China). I have three different versions of Pac-man, a couple Ms. Pac-mans, a couple different Sega/Sonic ones, and even a Scooby-Doo one that are all not NOAC. The Scooby-Doo is probably the simplest, and still has graphics and colors that the NES just can't do. But in fairness, there are SO many of the "crappy" Chinese/Japanese ones that I guess that is technically "most." Just where I live here in Southern California, doesn't seem most retailers mess with that stuff. Not to be arguing, just enjoying the conversation I never get to talk to people about this stuff! why dont you just use the original joystick and just use some dry wall screws to attach to a hole in cabinet so you cant see anything exept the stick and ball!! this way you can KEEP THE TWIST FEATURE I assume the twist feature is just a left right switch .. GOOD LUCK..